The Australian Senate has formally censored a lawyer who exclaimed anxiety by blaming New Zealand's mosque attacks on Muslim immigration. 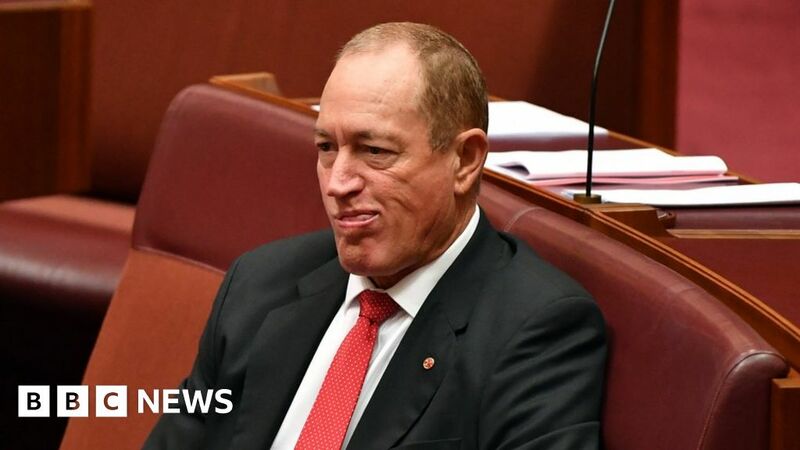 Senator Fraser Anning, a far right independent, made his comments on the shooting in Christchurch, killing 50 people last month. On Wednesday, lawmakers across the political spectrum condemned their "inflammatory and divisive" remarks. Anning said the censorship was "an attack on freedom of speech". The fifth, adopted by the Senate in the last decade, stated that last month's remarks did not reflect the views of the MEPs or the Australian people. He had said, "The real cause of bloodshed on New Zealand's streets Today, the immigration program that allowed Muslim fanatics to transfer to New Zealand in the first place." His remarks were "shameful" and "terrible" other lawmakers told the senate. The censorship read that Mr Anning had attempted to "blame the victims of a terrible crime and to limit people on the basis of religion". Although it does not carry any practical punishment, censorship is seen as an official condemnation. Legislators cannot be expelled from parliament unless they are dual citizens, bankruptcy, have other offices or have been convicted of an offense, say constitutional experts. Only one senator, Cory Bernardi, voted against the proposal on Wednesday. Three others including Mr Anning abstained. Anning entered parliament in 2017 as a replacement for a disqualified senator, despite receiving only 19 votes in the 2016 election. Last year, he also condemned the use of the words "final solution" – a concept invoked during the Holocaust – while encouraging race-based immigration restrictions. More than 1.4 million people signed a petition calling for Mr Anning's departure in the days following his comments on 15 March. At that time, New Zealand Prime Minister Jacinda Ardern called his remarks "a disgrace". In a highly publicized incident, a teenage protest fought an egg on the senator's head during a press release. Mr. Anning has repeatedly defended his comments. He left the Senate on Wednesday before the decision was adopted. Heads of government Mathias Cormann said that Mr Anning's comments were "unfortunately worse in view of [his] position in this parliament". Minister of Labor Senator Penny Wong said there was "a difference between freedom of speech and hate speech" and added: "While the injured were being treated, this senator sought to further awaken the division's flames."